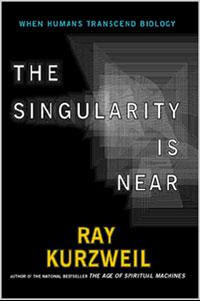 I finished reading "The singularity is near" by Ray Kurzweil (yes, I did! ;). I don't think there's another book out there with such a fine analysis of technology's evolution and evolution of humankind, or for that matter another person that has thought as deeply and thoroughly on this subject. The book really pours information all the way from beginning to end regarding technology in general, computing, nano technology, robotics, genetics, physics and more. Obviously there's a lot of speculation (as it ought to be in the field being) it makes a lot of sense and it asks the right questions. I have to admit this is my first Kurzweil book, so I don't know how it'd feel for someone that already read previous ones. We needed a new Carl Sagan. Kurzweil not only knows and thinks incredibly about the matter of evolution, in addition he seems to have the decision and the capacity to communicate his ideas even risking to be seen as mad or naive. It seems like the movie is coming ... this is very interesting as it might have the capability to make massive information that otherwise might be hard to consume.